Once upon a time this used to be the most important square in the city of Cartagena. The town's main administrative buildings used to surround it, and it was used as a parade ground. Most important among these was the Royal Customs House which now functions as the City Hall. 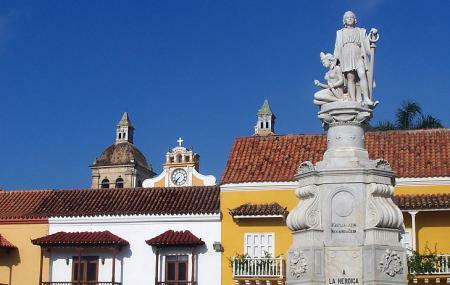 In the center of the square you will find a statue of Christopher Columbus. The founder of the city, Pedro De Heredia also lived here. There is not much to do here apart from checking out the lovely colonial architecture. However, there is a tourist information office nearby which makes for a useful stop. Excelente y pintoresco lugar, la ciudad amurallada un lugar de ensueño. Sugerencia, deberían restringir él tránsito, sólo mateos, y sólo en las calles periféricas anchas taxi. Ejemplo como tiene Colonia Uruguay que sólo se transita caminado o bici. Felicitaciones!! !